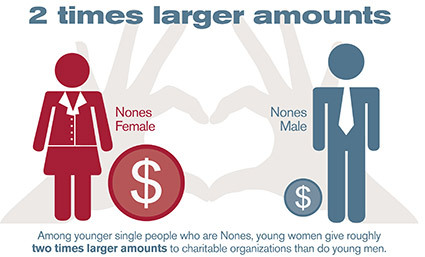 Nonprofits seeking new and generous donors should look to a seemingly unlikely source: young, single women who are not religious, a new study by the Women’s Philanthropy Institute at the Indiana University Lilly Family School of Philanthropy finds. Conventional wisdom says younger generations—Millennials and Gen Xers—are less generous than their predecessors. And previous research has found that people who are affiliated with a particular religion and who attend services regularly are more likely to give, and to give more, to both religious and non-religious charities than people who do not have a religious affiliation. The Women Give 2014 report confirms this positive relationship between religiosity and giving for most populations studied, but in an important shift from the standard religiosity-giving story, the study finds key exceptions that counter the conventional wisdom about both age and religiosity. Those exceptions have significant implications for how both religiously identified and non-religiously identified nonprofit organizations appeal to current and potential donors. Give two-and-a-half times more money to charity than middle age and older single women who are religiously unaffiliated. Give twice as much as young, single women who are religiously affiliated but attend services infrequently. Give twice as much as their unaffiliated male peers. Give twice as much to non-religiously identified organizations as they do to religiously identified organizations. The study is the first to examine in a single analysis the combined effects of religiosity, gender, and age on charitable giving. Prior studies have looked at connections between two of the factors but not all three. 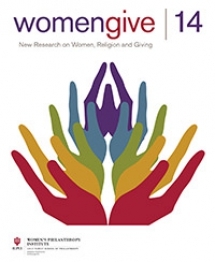 Women Give 2014 uses a multi-layered analysis to gain deeper understanding of how gender and age affect the traditional religiosity-giving relationship. The study of 762 donors (primarily Protestants and Roman Catholics) looks at their giving to organizations that have a religious identity (e.g., World Vision, Compassion International or Catholic Charities) and to organizations that do the same kind of work but which do not have a religious identity (e.g., CARE, Save the Children or United Way). Giving to congregations is excluded to allow a clearer picture of how the factors examined affect giving to other types of nonprofits. Women Give 2014 is the fifth in a series of research reports conducted at the Women’s Philanthropy Institute that focuses on gender differences in giving. Previous Women Give reports have examined differences between adult male-and female-headed households, looking at gender differences in charitable giving across income levels, marital status, age/generation, and types of charitable organizations receiving the giving. These reports, as well as the research literature, find significant gender differences in philanthropic behavior. Women Give 2013 assessed whether the gender differences observed in adult charitable giving begin to emerge at younger age. The 2013 study found that parents who talk to their children about charitable giving significantly increase the likelihood that those children will give to charity. The full Women Give 2014 report, as well as previous reports in the series, are available here. The Indiana University Lilly Family School of Philanthropy is dedicated to improving philanthropy to improve the world by training and empowering students and professionals to be innovators and leaders who create positive and lasting change. The school offers a comprehensive approach to philanthropy through its academic, research and international programs and through The Fund Raising School, Lake Institute on Faith & Giving and the Women’s Philanthropy Institute. Follow us on Twitter or “Like” us on Facebook.